I may have identified the root cause and discovered a remedy to a medically unidentified disease known on the web as Citric Acid Intolerance. Here’s the story and the remedy. I hope it helps you. In my mid-twenties I began suffering terrible, painful gastrointestinal problems that I soon attributed to acidic foods. That theory mostly held but not always. I could only live my life, get out the door, and not constantly worry about finding the nearest bathroom by keeping a strict diet of completely plain foods. Plain, as in baked or grilled or steamed; no seasoning but salt; no complicated ingredients; water or seltzer to wash it down. That could mean a burger with lettuce, no sauces, no tomatoes and no onions. It meant a salad of lettuce, carrots, and cucumbers with oil but no vinegar. It’s harder than it sounds and eating was difficult. Eating at a restaurant was nerve-racking. I ate like this for years but at least I got some of my life back. All the while I disagreed with doctors who diagnosed me with IBS (irritable bowel syndrome) and were lobbing random medicines to see what worked, including prescription medications with side-effects and even antacids. One doctor told me IBS was “a wastebasket diagnosis,” meaning if they did not know what the digestive problem was, it was IBS. I was not content with this hopeless life sentence. Since I had some control over the symptoms through diet, I had reason to believe there was a pattern that hadn’t been identified. Upon ingestion of problem foods and ingredients, symptoms did not manifest for at least a day, usually two. This happened consistently suggesting that my problem was not a digestive problem. If it was, the pains would have come within hours not days. There were ingredients and foods that were affecting me that at the time I did not consider acidic included sushi (not sashimi), mayonnaise, and canned foods like artichokes hearts and beans (but not all brands, surprisingly). There were ingredients and foods that I thought would affect me but didn’t such as coffee, apples, grapes, black pepper, and soy sauce (without naturally occurring alcohol). Foods and ingredients previously suspected were confirmed to be problems, such as tomatoes (especially cooked or canned), onions, mustard, sodas, and salad dressings. Since initially this did not entirely make sense, I kept track of every ingredient in every can or jar of whatever I was eating. I also researched fruits and vegetables to determine what exactly was inside them. Eventually this led me to my first discovery: there were only three things affecting me: citric acid, acetic acid (vinegar), and alcohol. There is a lot of talk about citric acid allergies, which is not the same thing. Allergic reactions are an immune response that usually manifest immediately, not a day later. Eventually I discovered Vicky Clarke’s page on what she calls Citric Acid Intolerance, a brave woman from England – the one person that corroborated my suspicions and documented her very similar (albeit more severe) plight in great detail. To find someone else who had been on this journey made me realize I was not imagining things – I was right! I wish I knew how to reach out to her to say thank you. Note the Acetyl and Citrate, from Acetic Acid and Citric Acid, respectively, and their relation to Coenzyme A (CoA). Eventually I deduced that the problem was dysfunctional metabolization related to the Citric Acid Cycle. Continued research showed that alcohol broke down into acetic acid, and both citric acid and acetic acid are integral to the Citric Acid Cycle (Krebs Cycle), specifically with relation to interactions with Coenzyme-A, a critical component of the the cycle. I surmised that this process was malfunctioning within me. Of course, I was not entirely sure and this line of thinking was probably a stretch considering my limited medical knowledge. However, it is a hypothesis that I feel I have since adequately proven. With the confidence that the Citric Acid Cycle was the issue I turned to another part of the puzzle I had discovered, that vitamin B5 had beneficial effects that eased my symptoms. Regular intake offered some flexibility in my food consumption but not much. At around the same time I was discovering the benefits of vitamin B5, Vicky Clarke updated her page to include mention of the same. More vindication; I was on the right path! Research into vitamin B5 revealed something that gave me further confidence in this direction. Vitamin B5, known as pantothenic acid, is also a critical component of Coenzyme A synthesization. 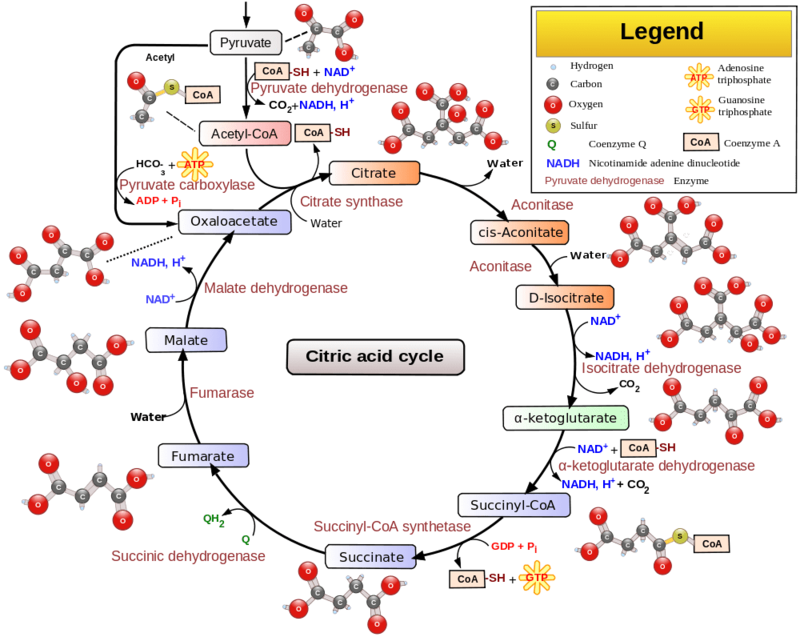 One more thing pointing to the Citric Acid Cycle. Coenzyme A is not like the lactose enzyme; you can’t just ingest coenzyme A, your body has to make it. So I needed to determine what supplements were necessary to help my body create more coenzyme A. I was fortunate to find that there was one lab that creates an over-the-counter supplement engineered for this, called Pure Coenzyme A. Although marketed as an energy boosting aid (and obviously not containing pure coenzyme A), it had the combination of supplements needed including pantothenic acid, pyruvate, and amino acids. I had nothing to lose by trying. I took one pill daily for three months before I experimented with eating citric acid- and acetic acid-rich foods. I still remember the terror of eating that first pizza slice. At that point I had not eaten pizza in years and so savored it, all the while dreading what may happen in a day or two. But the pain never came. It never came! As an extension of my food testing, for the next few weeks I experimented with one problem ingredient or food every few days. Eventually I hit a limit of how much I could eat but even then the pain wasn’t so bad. So I started taking two pills a day. And then even that limit broke. After a while two pills a day was too much and I moved back to one a day. There are days now that I skip the supplement intake entirely. I still need to take it but I have no dietary restrictions anymore. I eat everything without concern. There is no more pain. (One point of clarification I want to make in my thinking here: I assumed when I was testing that the number of supplements I took would have a direct correlation to the amount of citric acid I could consume. However, I eventually realized that there wasn’t a one-to-one correlation between the pills and the food. It seems that maintaining adequate levels of these substances within me is necessary to promote proper metabolization and has little to do with the number of pills and the amount of CA ingested. I repeat: I have no dietary restrictions at all. None at all! Ten years after I first experienced symptoms, I got my life back. I’m several years in from that point and still doing great. And I want you to have your life back too. So here are my suggestions if you think you’re suffering from the same thing. Disclaimer: I am not a medical professional. While none of what I discuss involves prescription medications or medical procedures, please don’t take my assumptions as doctrine and do contact a doctor if you have concerns. While doctors have never heard of this problem, they can at least tell you if the supplements I’m suggesting are okay for you to take. Also, if there are errors in my thinking, I would appreciate clarification to refine the theory. While I did confer with a biologist who agreed with some of my assumptions, I’ve only tested this on me. Testing and identifying whether you have problems with the Citric Acid Cycle is the first step. It might also be the hardest. As mentioned, problem ingredients are found in many, many foods so isolating requires significant determination but it is possible to do. Many canned foods use citric acid as a preservative and it’s usually, but not always, listed in the ingredients. Example: artichoke hearts or canned beans. Vinegar is mostly acetic acid. Anything containing vinegar is going to be a problem, including sushi which contains rice wine vinegar in the rice. Alcohol breaks down into acetic acid, as mentioned previously. Many vegetables, especially when cooked, have high concentrations of citric acid, such as tomatoes and onions. Citrus fruits such as oranges, lemons, and pineapples have high concentrations of citric acid. Most condiments have any one or more of the following: citric acid, vinegar, tomato, onion (or onion powder), or citric fruit juices. Powders derived from onions, celery, or the any substances derived from ingredients that are a problems in another form. Honorable mention: Phosphoric acid. This is an artificial acid and I have not researched why it is problematic but ingestion has shown it is. Fruits such as apples and grapes are fine in moderation because they have tartaric acid not citric acid. Bananas are also fine. Sodas that use tartaric acid (from grapes) instead of citric acid, like Blue Sky Organic Cola, for example. Meat, fish and chicken, either plain or mildly seasoned with foods not ordinarily a problem (e.g. herbs). Soy sauce is one of the few saucy condiments that does not have problematic ingredients. Just be aware of those with naturally occurring alcohol mentioned on the label. Dairy. If lactose intolerance is a problem, it is a separate issue and can be managed with over-the-counter supplements like Digestive Advantage. Sugary items, such as cookies and cakes without problematic ingredients are fine. Fortunately there are several sites that offer Citric Acid free recipes but I highly recommend sticking to plain foods to better isolate ingredients. Here are a few. Vicky Clarke has a few recipes of her own. The Citric Acid Allergy site is excellent and continually updated. The author calls herself the Lemon Ninja and with good reason. Some great coping and managing advice on the site too. There’s a good blog called Cocoa, Colourings and Citric-acid Free Eating. Be cautious with the recipes on Pinterest but take a look. Test yourself by STRICTLY limiting your diet to plain foods with very few ingredients. If you were unable to stabilize your digestive problems then either Citric Acid Intolerance is not your problem or you have not been as strict with your diet as you need to be. Stick to plain foods and water until digestive issues have stabilized. Introduce one food with either citric acid or acetic acid. Eat once, don’t eat anything else with citric or acetic acid, and wait a few days. Document the reaction. Over time there should be a pattern showing you that citric acid and acetic acid are without question the cause of your problems. Now stop testing and return to a plain diet. Start taking the over-the-counter supplement, if it’s okay for you to do so. Pure Coenzyme A is not commonly found everywhere but you can certainly order it from Amazon. Also, most of the components of Pure Coenzmye A can be bought separately more easily if preferred. Take for a month or more before you start the food testing again. After a month or more, introduce one known problem food or ingredient. As before, eat once, then stick to plain foods, and document the reaction over the next few days. If there is a difference in your reaction – notably, if you have no reaction – things are working. I hope this works for you. Please let me know if this information has helped you in any way. Wishing you the best of luck and good health.